The Infoprint 2090ES can help transform your business to become more competitive and win in the marketplace. In addition to printing at 90 IPM for Infoprint 2090ES the printers have an 80 IPM integrated networked scanner that supports digital copying at 90 copies per minute. The Infoprint 2090ES has a high-performance controller with an 800 MHz PowerPC 750FX processor with 512K of on-chip L2 cache, and a 133 MHz data bus. The controller has an onboard 10/100/1000BaseTX Ethernet attachment and a Peripheral Component Interconnect (PCI) Bus for an optional token ring adapter. SDRAM MEMORY: Standard memory is 512 MB of 266 MHz DDR memory. Maximum memory is 1.5 GB using 2 slots for memory features. HARD DRIVE: A 40 GB hard drive comes standard with both printers. With the IPDS feature, IPDS Single Byte Character Set (SBCS) and Double Byte Character Set (DBCS) fonts come stored on the hard drive. With the PCL/PostScript feature installed, SBCS fonts including Southern Europe, Middle East, Africa (SEMEA) PCL fonts are available on the hard drive. IBM AFP/IPDS: Infoprint 2090ES supports IBM’s AFP/IPDS with the optional IPDS feature. The PostScript Japanese feature includes Double Byte Character Set DBCS support with Morisawa fonts (GothicBBB-Medium and Ryumin-Light). This feature should only be ordered if double byte support is required. PCL/PostScript is a prerequisite for this feature. The Japanese PCL/PostScript feature is tied to a specific machine and is not interchangeable with other Infoprint 2090ES and 2105ES machines. TOKEN-RING: Infoprint 2090ES and 2105ES support an optional token ring 4/16 adapter in addition to the standard Ethernet attachment. However, only one attachment, Ethernet or token ring, can be active at a time. The token ring attachment supports printing only (no scanning). 802.11B WIRELESS ADAPTER: Infoprint 2090ES and 2105ES support wireless Ethernet attachments based on the IEEE 802.11b standard. Wireless Ethernet can be used for any of the Ethernet attachments (printing and scanning). Infoprint 2090ES and 2105ES have a full-color 9-inch LCD (D-STN), 640 x 480 dot control panel. It consists of an LCD touch-screen, hard keys, and colored LEDs for status. 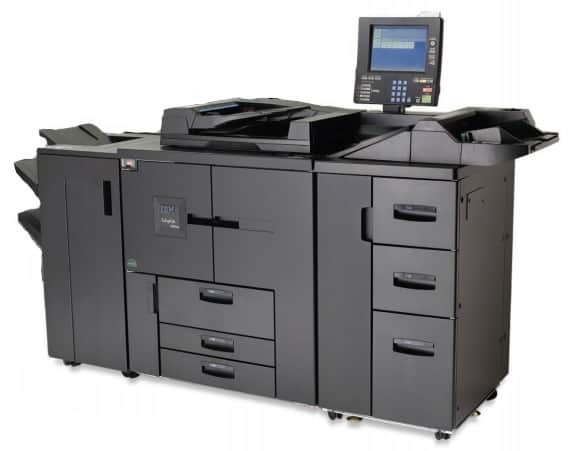 Infoprint 2090ES comes with 3,000-sheet input capacity standard. This capability includes three input drawers. An optional 4,550-sheet High Capacity Feeder with three drawers is available and also an optional auxiliary tray is available which increase the maximum input capacity to 8,050 sheets. An Interposer tray is also available. Duplex capability comes standard with both printers. Custom paper sizes are supported in trays 2, 3, and 7 (auxiliary tray). Custom size is 148 mm x 210 mm (SEF) minimum (5.5 in. x 8.3 in.) and 305 mm x 458 mm (SEF) maximum (12 in. x 18 in.). Custom paper sizes run at 12 in. x 18 in. (305 mm x 458 mm) speed and are supported in PostScript, IPDS, and PCL 6, but not PCL 5. Infoprint 2090ES prints the front side of duplex pages first. This means preprinted forms that will be used for both simplex and duplex jobs can be loaded in a single tray and used effectively with no extra steps required. Forward collated tab stock is supported in drawers 4 and 5 of the high capacity feeder option and in the auxiliary tray. A finisher must be ordered with the printer. The Infoprint 2090ES printer can be configured with the 100 Staple Finisher or Booklet Finisher. This 3,000 sheet finisher comes with stapling and saddle stitching capabilities. It has a proof bin with 250-sheet capacity (A4/Letter), a lower shift bin with 3,000-sheet capacity (A4/Letter) and an upper shift bin with 500-sheet capacity (A4/Letter). It has shift (offset) capability and a stapler that can staple together up to 50 sheets. Jobs cannot be stapled and shifted. If a job requests both of these, it will be stapled only. Saddle stitching is supported on jobs of up to 15 sheets. An Interposer tray option is available for both finishers. It allows media such as front and back covers to be inserted after the print media has been through the fuser. The inserter tray has a 200-sheet capacity (80 gsm, 20 lb). There are three print modes; Refine, Normal, and Econo. Refine mode is the default and offers the best overall print quality. Normal mode is slightly darker than Refine mode and Econo mode is slightly lighter with reduced toner usage. Both printers support a printable area of within 4 mm of the edge on all sides for IPDS and PCL/PostScript data streams. Edge-to-edge mode allows printing to within 2 mm leading edge and 0 mm on all other edges of the media. The only exception is 12″ x 18″ media which is printed at an A3 size. The maximum monthly usage for the Infoprint 2090ES is 800,000 impressions. IBM does not recommend printing to this monthly maximum on a consistent basis. This feature (feature number 4900) provides installation of the printer and features. Simplex and duplex originals can be copied by either placing them on the scanner glass or utilizing the ARDF (Auto Reverse Document Feeder). The ARDF is a fast and versatile scan feeder, capable of handling up to 100 sheets at a time (80 gsm, 20 lb). The ARDF can scan pages up to 80 PPM (8.5 x 11 inch or A4). The ARDF can handle a wide variety of paper sizes from 5.5 x 8.5 inch (140 mm x 216 mm) to 11 x 17 inch (279 mm x 432 mm). Up to 12 x 18 inch originals can be scanned on the glass. The ARDF can scan mixed paper sizes and weights in the same stack. The ARDF is also capable of automatic paper size selection and automatic paper reduction/enlargement on a sheet-by-sheet basis. It scans originals at 8 bit gray scale and 600 dpi.